Am I Truly Following Jesus? Jesus invited His disciples on a journey by asking them to follow Him and become fishers of people. At the end of His earthly ministry, Jesus encouraged these disciples to continue that journey by telling them to go into all the world and make disciples. As with the early disciples we are invited on this same journey. Jesus' invitation should prompt us to lead believers to answer the question, "Am I truly following Jesus?" Tony Hoffman, Associate Team Strategist for the Florida Baptist Convention and member of the 4:12 Network, provides 6 evaluators you can use to help adults answer this question in his book, Follow. A disciple should be a . . . 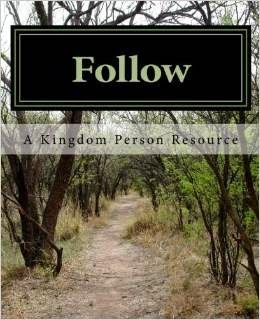 Follow provides self evaluation tools for determining where a person is on the journey to follow Jesus. Providing this to believers will enable them to develop a path of discipleship that will help them become stronger followers of Christ. Employing a spiritual development process. This plan is available in the book, The Kingdom Person Strategy. Tony wrote these two resources to help Florida Baptist Convention churches and are available to you for a nominal fee. I would recommend you check out these resources and consider how you can use them personally and to help your church develop an ongoing discipleship strategy.